The Bridgestone Expedia S-01 tire combines a Z speed rating to go with awesome handling and cornering abilities to produce an ultra high performance summer driving tire. How good is this tire? The fact that it is original equipment on the Ferrari F348 pretty much sums it all up. The aggressive tread design provides incredible dry road performance. Cornering power is among the best tires in its class, while wet pavement stability is also way above average. Prices on Bridgestone Expedia tires range from a low of around $215 for the 17″ series, to above $300 on the 18″ models. 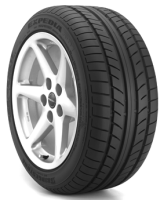 Who Are Bridgestone Expedia S-01 Tires Designed For? Bridgestone has designed the Expedia S-01 tires for drivers who own high performance sports cars and coupes and desire the best in traction and handling. Bridgestone tires provides no tread wear warranty on the Expedia S01, but you will find a first 1/32″ of wear uniformity guarantee. There is also a materials and workmanship guarantee for 5 years or until 2/32″ of tread life remains. It calls for a free replacement during the first 3 years, followed by a prorated amount for the remaining time period. Bridgestone includes their 30 day buy it and try it guarantee whereby they will allow you to get a refund or exchange the tires for other models if you are not satisfied.